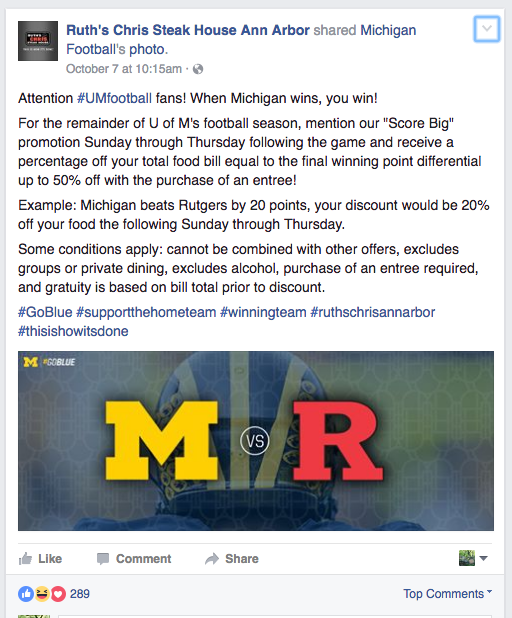 On Friday, October 7, 2016, the Ruth’s Chris Steak House in Ann Arbor Michigan shared a promotion on its Facebook page regarding the Michigan vs. Rutgers game. The promotion stated that whatever the point difference in the final score of the game between Michigan and its opponent for the remainder of the season, the restaurant would provide that as a discount off your food the following Sunday through Thursday. In the image below, you can clearly see it’s stated that there is a 50% cap on the discount. Here you can see that a Facebook user shares a screen grab of the original post made by Ruth’s Chris Steak House Ann Arbor. The 50% cap is clearly not mentioned. The game was on October 8th and her post is on October 9th, with the original Facebook post going up on the afternoon of October 7th. Just to give you a bit of the timeline. As you may know, the final score of the game on Saturday was 78 – 0. In case math isn’t your thing, that’s a 78 point difference, leading many to believe a 78% discount was forthcoming. Lots of people were looking forward to their nearly free steak dinner at Ruth’s Chris Steak House in Ann Arbor. But hold your horses! Not long after the game, excited fans found out the restaurant had a 50% cap on the discount, which wasn’t included in the post of October 7th until some point after the game was either in progress on October 8th or over. Many of the comments on the post are people who think that Ruth’s Chris is not honoring their offer. I’ve received a number of emails about this, so I figured it’s easier to just write a post explaining some of the legal issues involved. This was neither a sweepstakes or a contest so those laws would not apply. This is what is legally known as a giveaway since it applies to all potential customers. It’s important to know the difference between a sweepstakes and a contest, and your general consumer promotion because while there are some rules that overlap, citing statutes or laws that don’t apply doesn’t help. This was a local consumer promotion. Even though it was on Facebook, the promotion was only for the one location in Ann Arbor. This is important because you’d need to focus on Michigan state law. While the FTC may have some interest in consumer protection, this is not likely something they’d pursue and would defer any legal action to Michigan state authorities. Facebook has rules for businesses that run promotions on their page. If a page violates Facebook guidelines, it’s up to Facebook to do something about it. 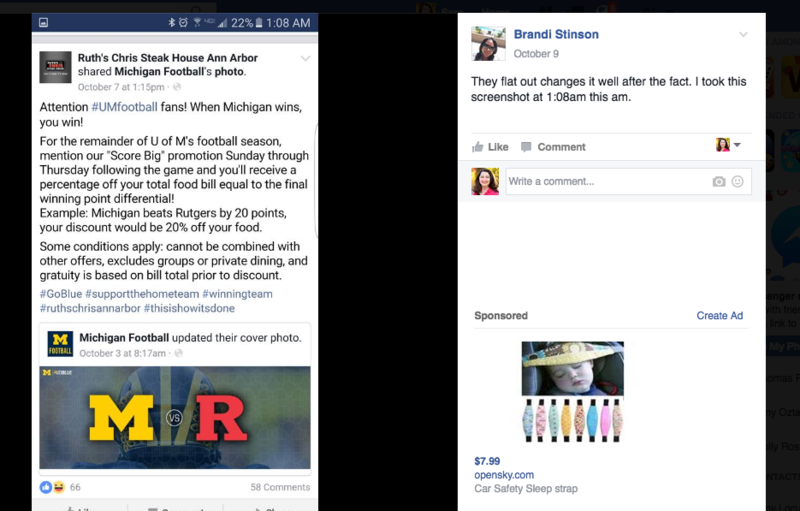 Did Ruth’s Chris of Ann Arbor violate Facebook’s? In fact, yes. There is no waiver of liability with regard to Facebook, as required by the Facebook Page Terms. That’s not a legal issue; however, it’s a Facebook compliance issue. And, to be honest, Facebook is not very consistent in the application of their Page Terms so it’s unclear what would actually happen. Perhaps Facebook did do something and we just don’t know. As a brand or agency administering a page you need to know the rules and understand that ‘something’ may happen if you violate them. Even if you’re not sure what that ‘something’ is. Below is a screenshot of the full post, incase the link doesn’t work. Yes, Ruth’s Chris Ann Arbor used third-party intellectual property as part of their promotion. I don’t suggest you try this unless you’re a big enough brand. And even then, talk to your legal department before you create a promotion that incorporates another party’s intellectual property. Without permission, using both the trademark and copyright of two major universities without permission presents a number of problems.First, trademark infringement is serious business, especially with regard to major universities that make big bucks off their trademark. Second, in a situation where you’re using a registered copyright without permission and no Fair Use claim the damages and legal fees can be very expensive. It’s unclear if Ruth’s Chris has any agreement with Michigan to use its name and intellectual property for promotion purposes. By using the Michigan trademark, Ruth’s Chris implied that Michigan endorsed this promotion. I doubt this location has any relationship with Rutgers University so, while use of the Rutgers’ trademark was in relation to the game against Michigan, this is the type of situation general counsel hate because it’s really a no-win because they come off looking ridiculous if they pursue something at such a local level, but at the same time there are internal trademark compliance protocols that indicate how intellectual property protection matters are handled. 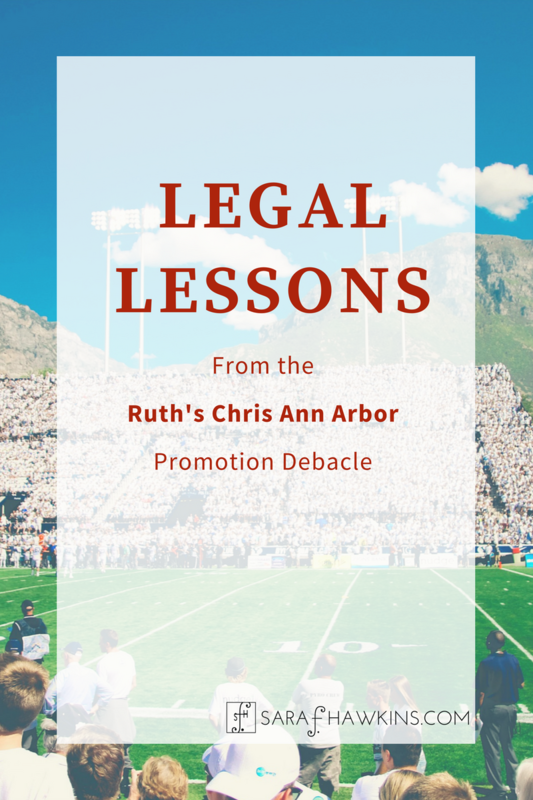 Even though Ruth’s Chris Ann Arbor used the share functionality within Facebook, which would be covered by the platform’s various terms of service, the fact that they used it in conjunction with a marketing promotion could negate any license. Truth in advertising is what this really comes down to. All consumer promotions must be truthful and if there are conditions, they should be communicated to the consumer either directly or in a way that provides the consumer access to that information. There is proof that the Facebook post was changed. I tried to go into the edit history but no history returns. The original post does state that “some conditions apply”. But what conditions? The post lists a few, but when it comes to legal disclaimers there are a number of ways to read the short list, specifically looking at the nature of the exclusions. There is nothing that states there is a cap on the discount and the stated exclusions are not similar to a cap on the discount. As a lawyer, that would have been something I would make clear because it’s a very important part of this promotion. If a lawyer was involved, perhaps consumer promotions is not their area of expertise. Maybe they overlooked it. However, my guess is that a lawyer was not involved. When it comes to consumer promotions and truth in advertising, the laws are a maze that can be quite confusing. However, Michigan’s unfair or deceptive trade practices laws are quite clear. Ruth’s Chris Ann Arbor screwed up. They clearly admit it in their comments. The page admin states that the 50% cap was not in the initial post. The response from the page admin, though, was AFTER the game was over. If you read the Michigan statute, you might agree that there are several sections of the Michigan Consumer Protection Act that could apply. So why is this a big deal? 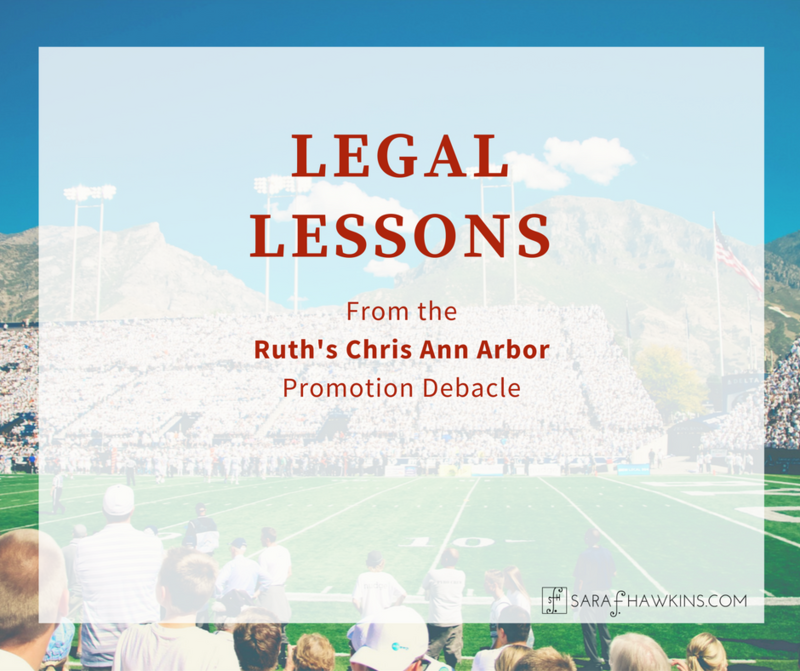 Besides the fact that it’s a publicity stunt gone wrong, it demonstrates that when the legal department (or a lawyer) is not consulted on a consumer promotion the company can end up dealing with problems they did not anticipate. It’s one thing to understand the risk. In this situation, though, I don’t think the person/team/department/agency that came up with this promotion understood the multiple risks they were taking on behalf of the business. As a consumer, what do you do? As I tell people who ask me this question, consider filing a complaint with the state Attorney General. As consumers, your rights are protected by various state and federal laws. If you have a good faith belief that your rights have been violated then you have the right to let your regulatory agency know. Can they force Ruth’s Chris into honoring their advertised promotion? I’m not sure what Michigan’s Attorney General would do, but honoring the promotion might be one of the options. If you’re an agency or brand, what do you do? Well, involve your legal department or consult with an attorney knowledgeable in consumer promotions as well as the use of third party intellectual property. If you work on behalf of an agency, a promotion like this could cost your company the account. If an agency was responsible for this posting, Ruth’s Chris of Ann Arbor may have legal recourse against the agency if the restaurant incurs costs or damages related to legal violations. If you work for the brand, speak up and ask if it should be run past legal. We all know that someone will be held accountable if the policy is to run things like this past legal and it wasn’t. Overall, this promotion turned what should have been a fun way to support the community into one where the local community is questioning the integrity of the business. So, what are the takeaways? Involve legal when running any type of consumer promotion. There are state and federal laws that must be followed. Even if you don’t know what they are, you are required to adhere to all laws. Don’t use the intellectual property of any third party without permission or talking to legal first. Copyright and Trademark infringement can be a very expensive consequence. Realize that if you screw up, the court of public opinion will often exact a more harsh penalty than any court or regulator. Have a contingency or crisis plan in place, just in case. In the end, things may turn out just fine for Ruth’s Chris Ann Arbor. Plenty of customers are getting a great meal at a fraction of the cost. Those who are mad they aren’t getting the full 78% discount may have some valid concerns, but a 50% discount at Ruth’s Chris is not too shabby either. I got engaged at the now-closed Ruth’s Chris location in Phoenix so I have some pretty great memories connected to those sizzling plates. Disclosure: I have no business or legal relationship to any party involved in this matter. This post reflects only my thoughts and is not offered as legal advice. 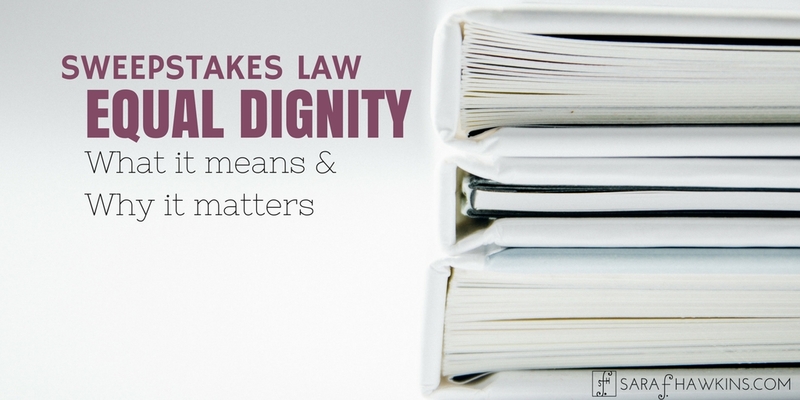 If you are in need of legal advice, seek a local attorney knowledgeable about this matter. I just signed up for techcrunch sweepstakes and they popped a “like us” for extra entries. That seems contrary to your Facebook gating article. Did AOL mess-up? Facebook removed its ‘like gating’ function in 2014. At that time, Facebook changed its Terms but a ‘like’ was still seen as a permissible entry option with regard to complying with Facebook’s Terms and Guidelines. While sweepstakes may allow for additional or bonus entries, those entry forms must comply with all laws, be detailed in the official rules, and comply with any platform or service associated with such entry. Don’t forget to follow those “truth in advertising” laws…unless you’re the government, of course! Then you’re exempt, and can lie to lottery entrants in poor communities, telling them that portions of their collected funds will be used to improve local public schools, etc. when the gov. has absolutely no intention of using monies for that purpose. Pretty cool world we live in! While a state governmental agency or service, such as the lottery, may not be subject to ‘truth in advertising’ laws, per-se, the misdirecting of funds is an issue that citizens can inquire about and if funds are not being allocated or used as required there are other laws that deal with those issues.